Give someone oysters from their own Puget Sound oyster bed. Rent a 2019 Oyster Bed! Tucked away on Washington State’s Pacific Coast are the cold, pure, pristine waters of Puget Sound’s bays. These protected inlets, with their constant, rich supply of plankton and shallow, warm water conditions, are a veritable “oyster heaven”, assuring you of pure, fresh, and delicious oysters, flown straight to your door for a true gourmet experience anytime. The Pacific oyster’s pungent, ocean-y taste is why it is the most coveted oyster in the world. The Oyster Lease yields 4-dozen three-year-old oysters that are delivered by air (recipes and shucking instructions are included). To heighten anticipation, gift recipients will receive a progress report (newsletter) informing them about conditions in the Northwest bays and the hard work involved in protecting this natural resource, as well as some practical advice on the preparation of oysters (and some impractical advice from Lewis Carroll). The personalized lease documents include instructions about how your recipient can use our website to arrange the delivery of their oysters. We do all the work and you get all the raves (while helping support America’s oyster farms). Sorry, oysters can’t be shipped to Hawaii or Alaska. 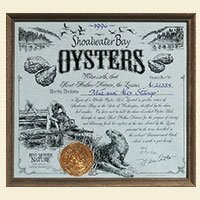 Leaseholders receive four dozen pure, fresh & delicious oysters flown straight to their door from their own Oyster bed in the cold, pristine waters of Washington’s Puget Sound -a true gourmet experience. Pacific oysters, renowned for their pungent, ocean-y taste, are the most coveted oysters in the world. Sorry, oysters can’t be shipped to Hawaii or Alaska. Thank you for wonderfully fresh and delicious oysters! The oysters were excellent, arrived on schedule, and were a wonderful addition to my party.